I’ve been blogging a whopping 6 years already and I can’t believe it! I have had a blast and one of the things I’ve enjoyed most is the community that food blogging is. We are there to support each other, feed off each other and toss ideas back and forth. It’s really not a competition but a community. It’s pretty awesome. I’ve also “met” a lot of awesome people along this journey. Today I’m introducing you to one of them and her brand new cookbook! 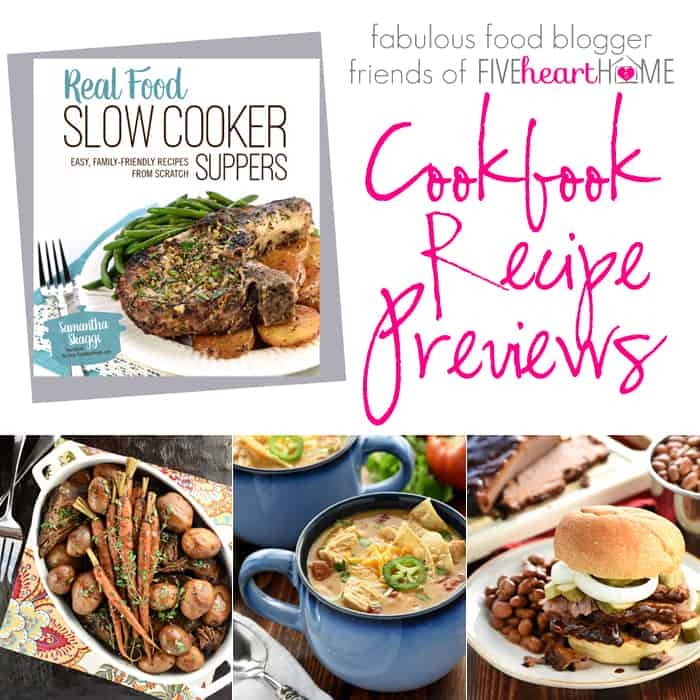 Samantha over at Five Heart Home has an amazing new cookbook, Real Food Slow Cooker Suppers, that was just released! I know all of you love your slow cooker as much as me! 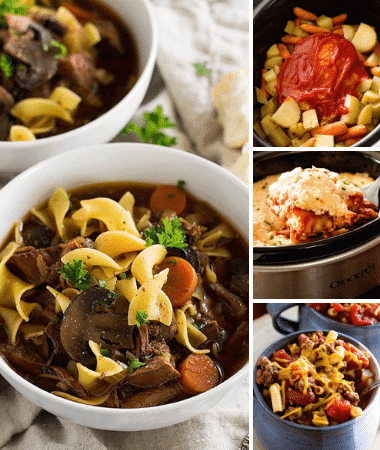 Some of my favorite slow cooker meals are Crock Pot Chili Mac, Slow Cooker Tomato Basil Soup and Turkey Crock Pot Breakfast Casserole Recipe, YUM!! So I just had to share her book with YOU!!! Not only is Samantha a total sweetheart but she somehow managed to pull off developing 80 Slow Cooker Dinner Recipes that call for all real, fresh, unprocessed ingredients while raising three young kids! Plus, she kept up her blog while doing this! In this cookbook, you can expect to find beautiful pictures to accompany each of the 80 recipes, a variety of family-friendly main dish recipes influenced by a variety of cuisines and metric conversions for each recipe! 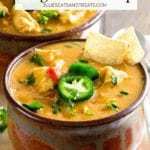 I choose to try out the Slow Cooker King Ranch Chicken Soup and it was FABULOUS. If all the recipes are this good I’ll be using this cookbook every night! I was secretly happy it was just me and Ry home when I made it so I could hoard all the leftovers to myself! It was the perfect, comforting soup with just the right amount of spice! Melt butter in a saucepan, add the garlic and sauté for about a minute. Whisk in flour, then slowly whisk in the chicken broth. Increase the heat to a simmer and continue to whisk for several minutes, until the sauce has thickened. Remove from the heat, and stir in chili powder, cumin, garlic powder and salt. Season to taste with black pepper. Set aside. Place the chicken breasts in the crockpot. Top with diced tomatoes with green chiles and jalapeño. Pour the sauce over the top. Cover and cook on low for 4- hours, until chicken is tender. Remove the chicken and place on a cutting board. Dice the chicken, then add it back to the slow cooker. Cook for 15 minutes, until the cheese is melted and the ingredients heated through. Serve with crushed tortilla chips, extra cheese and cilantro. You can grab a copy of Samantha’s cookbook at Amazon & Barnes & Noble! 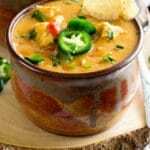 More delicious chicken soups to enjoy! Be sure and comment below – let me know how much you love this recipe and give it five stars! It is cheesy, delicious and totally AMAZING!! Also when you’re serving up a cup, be sure and tag me at @julieseatsandtreats or #julieseatsandtreats so I can see how yummy it looks on your table! 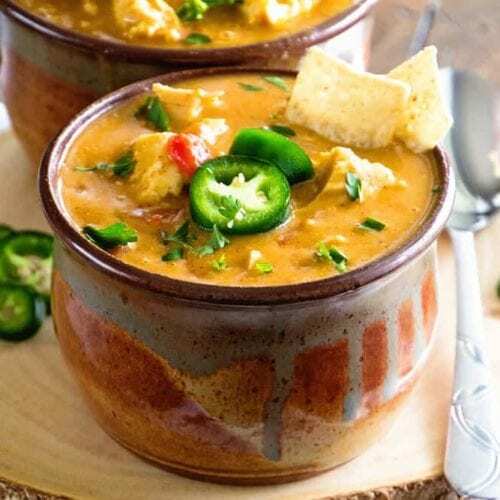 Your Favorite King Ranch Chicken Casserole Flavor Turned into a Comforting Soup Made in Your Slow Cooker! Melt the butter in a medium saucepan over medium-low heat. Add the garlic and saute until it is fragrant and light golden brown, about 1 minutes. Stir in flour and whisk continuously for 1 minute. Slowly whisk in the chicken broth. Increase the heat to a simmer and whisk continuously for several minutes, until the sauce is smooth and thickened. Remove saucepan from heat, and stir in chili powder, cumin, garlic powder and salt. Add black pepper to taste and set sauce aside. Place the chicken breasts in a large slow cooker. Top them with the diced tomatoes with green chiles and jalapeno. Pour the sauce over the top. Cover slow cooker and cook on low for 4- hours, until chicken is tender and cooked through, but not overcooked. Transfer chicken to cutting board, Stir cheese into the slow cooker and cover the slow cooker while you prepare chicken. 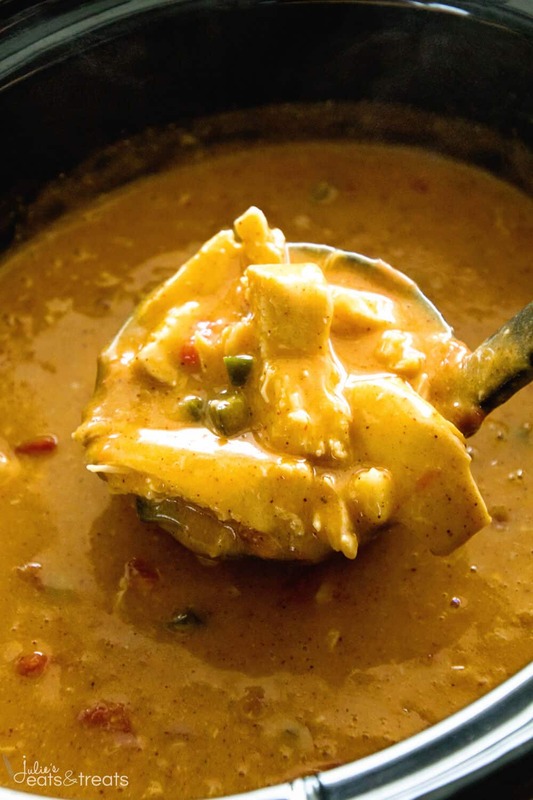 Pull chicken into large chunks and stir in back into the slow cooker. Cover the slow cooker and cook for 15 minutes, until the cheese is melted and the ingredients heated through. Stir well. 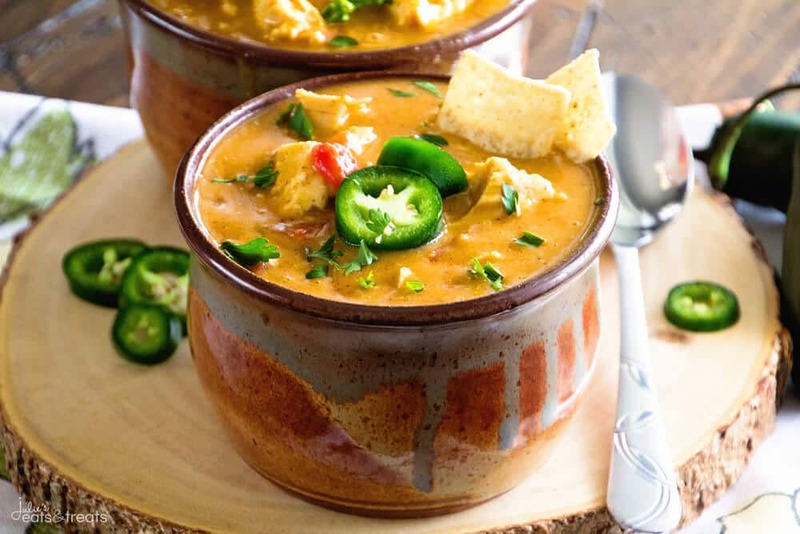 To serve, crush tortilla chis into a bowl and ladle the soup over the top. Garnish with extra cheese and cilantro, if desired. Here are some of the other fantastic recipes you’ll find in the book! Oh man, this is my kind of soup. I need to make this ASAP! 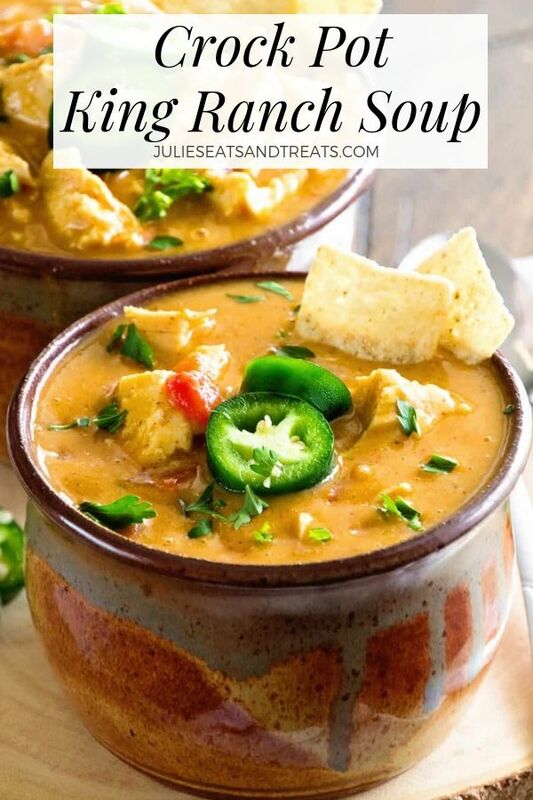 Thank you so much for sharing my cookbook and this recipe from it, Julie! I feel the same away about our community of bloggers…how fun to have a job where “co-workers” support and help each other so much! I’m very happy to count you as one of my blogger friends. 🙂 Thanks again for everything and I’m thrilled that y’all enjoyed the King Ranch Chicken Soup! Christine, King Ranch is a ranch in Texas where the casserole is said to have originated. It’s a staple in most Texas homes. No ranch dressing involved. 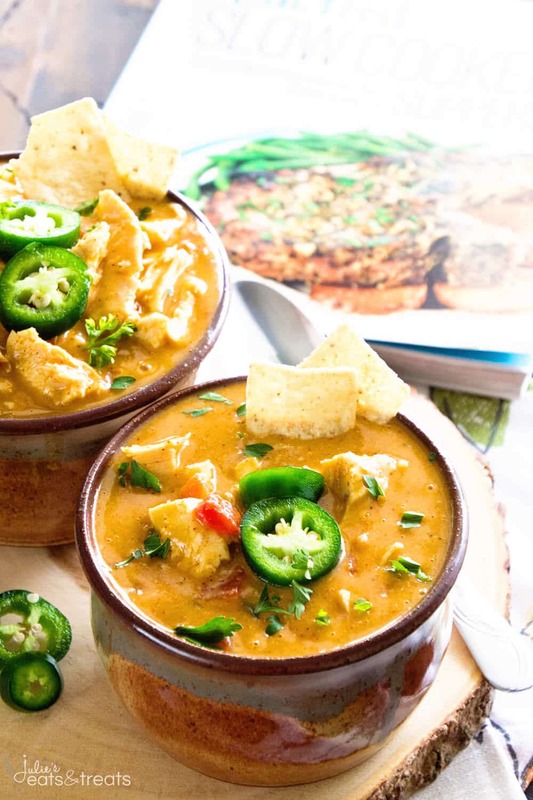 This is just like the king ranch chicken casserole we make in Texas, but soup so it’s better! Can I substitute Xanthan Gum or something in place of the All Purpose Flour? I did and it turned out yummy!! Has anyone tried making this in the instant pot? anyone know the fat protein and carbs? To make this keto friendly what do you use to substitute for the all-purpose flour? You use coconut or almond flour? I would like to know this too Sue.! I dont think all purpose flour is keto friendly. So coconut or almond, or does it matter at all? This was delicious! We used an already cooked rotisserie chicken and added a can of drained black beans. Exactly what we were looking for! Thanks! What is the nutrition (carbs, fat, protein) content? I have looked but can’t find how many servings this recipe is for? 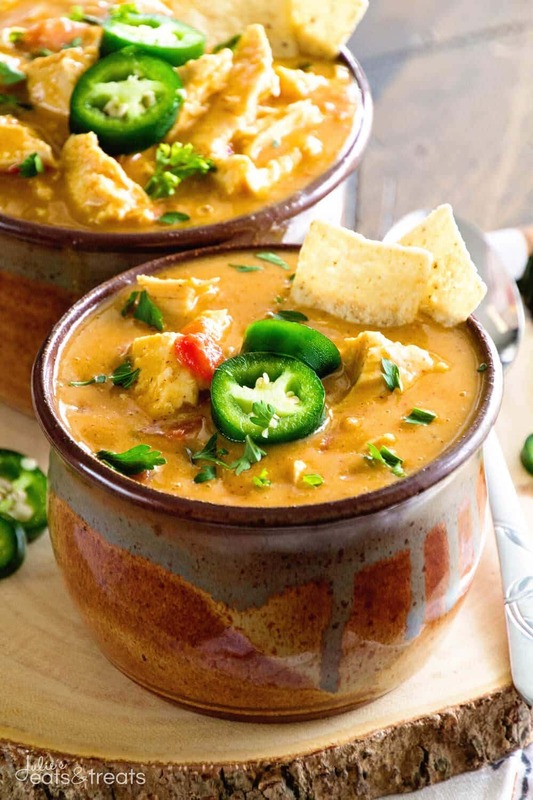 Want to make for Super Bowl party for 18 people…. It will serve about 6 people depending on big your servings are! I just made this tonight and OMG it’s delicious! Sooooooo full of flavor! I had leftover rotisserie chicken so that made the prep even easier. This is the second recipe I’ve made from this site and both were fantastic. (The other recipe was the meatball sub casserole. I’ve got a picky family, and everyone loved it) I’m a follower for life! Awwwww you are to sweet! I’m so glad you enjoyed this one too! It’s one of my faves and rotisserie chicken is such a great shortcut!